R.M. Schindler was among the least autobiographical of modern architects. He was born in Vienna in an age of reform that developed partly out of the nineteenth-century Industrial Revolution. His trail in Vienna led to the progressive architects Otto Wagner and Adolf Loos, and in America to Frank Lloyd Wright; yet what does one make of these platinum-coated associations? While it is possible to reconstruct the early years in some detail-Schindler's Vienna is remarkably intact physically, and his school records have largely survived-many questions, especially concerning the association with Loos, remain unanswered. Even his name provokes inquiry. Schindler wasn't Schindler. He was christened Rudolf Michael Schlesinger in Vienna's sixth-district parish church, St. Ägyd Gumpendorf, two weeks after his birth on September 10, 1887. His father, Rudolf Israel Schlesinger (1859-1940), was of Jewish descent; his mother, Franziska Hertl (1863-1952), was Catholic. One week before their marriage in February 1887, Schlesinger converted to Catholicism. Schlesinger is an opaque figure. He was born in Prague and at some point migrated to Vienna; he is identified in early documents as a Reisender (traveler) and Geschaeftsreisender (traveling salesman) and later as a Kaufmann (merchant). He spent ten months in America in 1880 and 1881. Franziska Hertl was Viennese; for many years she had a millinery shop on Mariahilferstrasse, Vienna's great shopping street. Between 1899 and 1906 Schlesinger fils attended the k.k. Staats-Realschule in sixth-district Vienna. His record was uneven; overall, he seldom rose above average. His best marks were in geometry and, by the time of graduation, freehand drawing. Potentially the most interesting aspect of this period is not his schoolwork but his name change: in 1901, the family name became Schindler. Several sources-a note appended to his birth record in St. Ägyd; his 1902-3 school record; and a document completed by his father and filed with the registrar of the sixth district-confirm but do not explain the reason for the change. After graduation from the Staats-Realschule in 1906, Schindler entered the Bau-(Architektur)schule of the k.k. Technische Hochschule in Vienna. Carl König (1841-1915), a prolific designer in the late Viennese Baroque tradition, was the dominant personality there. König's biographer Markus Kristan credits him with the development of "a kind of Austrian national style"; the Philipp-Hof (1882-84) on Albertinaplatz is representative (fig. 1). If Schindler was generally unaware of or unreceptive to König's work, he could not have ignored König's 1904 annex for the Technische Hochschule (fig. 2). In two decades, König's work had gravitated toward the prevailing Neoclassical style. König's legacy is both as architect and as teacher. He taught at the Technische Hochschule for nearly half a century; Josef Frank (1885-1967) and Friedrich Kiesler (1890-1965) are among his most prominent students. Although König was the contemporary of Otto Wagner (1841-1918), his work was rooted in the past. In a 1901 speech he rejected the aesthetic reforms taking place in Vienna and advocated instead a continuation of the architecture of historicism. Schindler attended two of König's classes informally, one in 1908-9, the other in 1910-11. Although in July 1911 he was awarded the degree of Diplom-Ingenieur, Bauschule (architecture school), Schindler clearly felt the need to continue his education in a less conservative institution. In October 1910, before graduating from the Technische Hochschule, Schindler entered the k.k. Akademie der bildenden Künste (Academy of Fine Arts), atelier of Otto Wagner. Wagner had more political capital than any architect in Vienna; his reputation had secured him the appointment to the academy in 1894. Wagner was a bridge to Modernism, and Schindler clearly understood the significance of his work. Wagner began his practice in the late 1860s and participated in Vienna's great Ringstrasse development. His early work was primarily academic and, as Carl E. Schorske has commented, "gave little reason to suspect in Wagner a modernist in the making." In 1899, he joined the Secession, a group of artists formed two years earlier who rejected the prevailing historicism. His later buildings-most notably the 1904-6 Post Office Savings Bank and his own second house of 1912-13-secured his lasting reputation. In 1910, Wagner was about to retire: Schindler was a member of his last class. Schindler's final project, described in extant school records in very old-fashioned German, was a theoretical "dead field" (cemetery) "in a great manner" for a city of five million people: it was a combination of Wagnerian rationalism and Beaux Arts fantasy. The document notes that he solved the task with talent and great diligence. He received a certificate of completion on July 1, 1913. I must tell you all I happen to know about Mr. Loos. His is [sic] born in Austria [sic: Moravia] but one of the greatest influences on his life seem to be the few years of his youth he spent in America. The result of this trip was a series of articles he published in a Vienna paper, giving an analysis of the modern aims and characteristics of the manners, architecture and life of the Western World. He spent many years in Vienna as Architect, doing mostly interior decorating and forming the only serious opponent against the architectural atrocities of the "Secession." At that time I visited the school of Otto Wagner and took up the fight for Loos inside of this group. Wagner was about to resign his position on account of his age, and I proposed to him to recommend Loos as his successor. A few of us got in touch with Loos, and as it seemed impossible for him to get the nomination, he resolved to start his own school. Between September 1911 and February 1914, while still a student, Schindler worked for the architectural firm of Hans Mayr and Theodor Mayer in Vienna. Mayr (1877-1919) had attended the Wagnerschule from 1899 to 1902; his student projects, Entwurf für eine Aussichtswarte auf dem Satzberge (building for a viewpoint) and Entwurf für ein Hotel (hotel façade), were published in 1900. He went on to become one of the most visible of Wagner's students; his work appeared frequently in Der Architekt and other journals. He first worked in an accomplished Jugendstil (Art Nouveau) manner that evolved into a version of academic classicism. His executed work included houses, restaurants, and a significant church in Bielitz (now Bielsko), Poland. By 1910 Mayr had formed a partnership with Theodor Mayer, about whom no biographical information has come to light. Possibly Mayr felt he was losing touch with the work of the younger generation: while working with Mayer and Schindler, Mayr's work moved decisively toward Modernism. Two works of 1912, the Handelsschule Allina (Allina commercial school) and the Haus des österreichischen Bühnenvereines (actor's clubhouse), both in Vienna, reflect the transition. The five-story school employs a version of the base-column-capital composition typical of early skyscraper design; ornamentation is kept to a minimum (fig. 3). Though less resolved than contemporary work in Wagner's studio (to which the great corner panel clearly pays homage), the school is a clear indication of new directions for Mayr and Mayer. The actor's clubhouse is another five-story composition with a penthouse (fig. 4). Its ground floor, with its rhythm of posts and octagonal bay windows and, especially, the cantilevered entrance canopy-which appears to anticipate Mies van der Rohe-is remarkably modern. The upper stories are less architectonic, suggesting a building in transition. This is the earliest executed building with which Schindler can be associated. His role is clarified in a letter from Hans Mayr which explains that in addition to other work, he worked on construction supervision of the Actor's Club. Schindler's break came in early 1914. General consensus is that he had seen the magisterial portfolios Ausgeführte Bauten und Entwürfe von Frank Lloyd Wright, published in Berlin by Wasmuth in 1911, and wanted to work for Wright. The argument is plausible: a set purchased by the Technische Hochschule that year remains there today. He secured employment with a Chicago firm, Ottenheimer, Stern and Reichert, through an advertisement in a local newspaper. Schindler resigned from Mayr and Mayer on February 10 and sailed from Hamburg on February 26 aboard the Kaiserin Auguste Victoria, four months before the assassination of Archduke Franz Ferdinand at Sarajevo, which led directly to the outbreak of World War I. During the summer I tried several times without success to meet you.... I am a young architect, a pupil of Otto Wagner in Vienna and startet 8 months ago for this country with the intention to study the development of the American architectur. I succeeded in getting a position, but I can't help to feel very unhappy in an average American office. This feeling is growing from day to day and my only hope is to come in touch with you. So I ask if you could admit me to your office or give an opportunity to study your finished works at a close range. Wright responded two weeks later, inviting Schindler to his office. He also arranged for Schindler to visit Mrs. Avery Coonley's house in Riverside, Illinois, "the best I could then do in the way of a house." Wright finally agreed to hire Schindler in October 1917, indicating to his staff that Schindler would be in charge of his office during his absence. Wright's chief projects at the time were the Imperial Hotel in Tokyo and the ongoing development of Olive Hill in Hollywood for Aline Barnsdall. Correspondence between Wright and Schindler makes clear their evolving relationship. Initially Schindler was asked to supply information about building materials and equipment. Over time he became involved in the design process of the hotel, various buildings for Miss Barnsdall and other, smaller projects, and increasingly he fell victim to Wright's vitriol. In one letter, he was admonished by Wright: "Regarding the prospective clients-'Schindler' is keeping my office and my work for me in my absence. He has no identity as 'Schindler' with clients who want 'Wright' ... the natural thing would be ... to lay it out as nearly as you can as I would do it and send it here for straightening." Wright's Chicago office was in the Monroe Building, designed by Holabird Roche and completed in 1912, but his physical and emotional center of gravity was Taliesin in Spring Green, Wisconsin. Schindler made several extended visits to Taliesin and was photographed there (fig. 5) in 1918 by Julius Floto (1866-1951), an engineer who was working with Wright on the Imperial Hotel in Tokyo. Schindler left no written impressions of these visits, but Wright was a well-known collector of Asian art and, analyzing the Kings Road house, one can easily assume that Schindler assimilated some of the spirit. In the spring of 1919, Schindler met Sophie Pauline Gibling, who within three months became his wife. Schindler's marriage was as progressive as his architectural affiliations. Pauline came out of Smith College, class of 1915, with an abiding, lifelong interest in social activism. She spent the summers of 1914 and 1915 working in the Boston slums; in September 1915 she became a "summer resident" at Jane Addams's Hull-House in Chicago. Pauline's activist instincts were equaled by a passion for music; late in life, she recalled first meeting Schindler at a performance of Prokofiev's barbaric Scythian Suite, which had premiered three years earlier in St. Petersburg. Greatly aroused, they "couldn't stay for the von Weber." The Schindlers' marriage on August 29 coincided with rabid political ferment in Chicago. A National Emergency Convention of the Socialist Party, fraught with dispute and "a flood of oratory," quickly fragmented and from the chaos the Communist Labor Party of America was organized. Its stated aim was "the overthrow of the present system of production in which the working class is mercilessly exploited, and the creation of an industrial republic." Analyzing the events, the New York Times concluded, "the new Communist Party in Chicago, [is] composed, it seems, largely of those so-called Socialists to whom admission to the Socialist Convention was denied." Although Pauline's fervor was probably far stronger than Schindler's, she spoke for both of them in declaring a short time later to her parents, "We are Communists!" I am with my comrade at the home of Mr. Frank Lloyd Wright.... Taliesin is a great estate,-a farm, an architectural studio, and a wonderfully beautiful home,-all in one.... The interiors, especially of Mr. Wright's private apartments, are like nothing I have ever seen. One walks into the rooms with a hush,-so highly-distilled is their beauty.... I can easily believe that Taliesin holds the highest beauty in America... .
We ... lead a really simple and primitive life in spite of all its beauty. For do not think, Ruth Imogene, that R.M.S. and I would accept lives of luxury. We are serious communists,-what people call Bolsheviki. Schindler must have discussed his political activity with Frank Lloyd Wright, prompting Wright to respond, "Your pragmatic mind is good soil for Bolshevism." Threaded throughout the dialogue between Wright and Schindler was the prospect of work in Los Angeles, both the completion of the Barnsdall development and new projects. In a letter sent from Tokyo on February 9, 1920, Wright indicated to Schindler, "I still look toward Los Angeles as a place in which I might turn your services to good account but I know nothing-absolutely nothing of what is going on there." Undeterred, Schindler wired Wright on April 17, "Going west May," and Wright responded nine days later, "Not needed west before my return." The sparring continued until late November, when the Schindlers finally left for California. The Schindlers arrived in Los Angeles on December 3, 1920, and began almost at once looking for a place to build a house. At first they wanted to live in Pasadena, "for we don't like Hollywood, except in the little canyons between steep mountain or hill ranges." By mid December they were intending to "build on a slope looking toward [mountains] ... perhaps by spring'; in January they had found "perfect spots for our studio." No immediate decision was made, however. In order to further my professional ends I have to go into a middleclass section ... the owners who have their residences across from us (one block of ground each) want to built up their surroundings nicely-and are not specially after the money-but after desirable neighbors. By dividing the lot with the Chases [sic] each of us takes the responsibility for only $137500 for which we could not get anything desirable anywheres. Schindler designed the house over a two-month period, in November and December 1921; Pauline noted that the details were "worked out ... in our many ardent conferences together." The house was to be "one architectural unit"; one wing for the Schindlers, another for the Chaces, "with certain utilities in common, and ... also a third studio, to be rented out." There were four distinct phases in the planning process, each a logical development of a theme. Schindler began with a pinwheel configuration that provided different orientations for each unit of the house: apartments for each family and a guest, a strategy consistent throughout the design development and one that he repeated in 1923 at Pueblo Ribera Court, twelve vacation cottages in La Jolla, California. In the first version (fig. 6), the wings for the Schindlers and the Chaces-called "studios" in his plans-were accessible only from outside corridors. The second scheme, dated November 1921, very nearly approximates the house as it was built except that Schindler has indicated the layout for one family with conventional designations for the studios: living room, dining room, and two bedrooms (fig. 7). Another plan shows how the "building may be converted into a room residence by adding a few partitions" (fig. 8). The final scheme, shown in a pair of singularly unlovely drawings, is dated December 1921 (figs. 9 and 10). In this plan, a nursery defined by low walls has been incorporated into Clyde's studio in anticipation of the arrival of the Chaces' first child. Expecting to begin construction at once, and again emphasizing economy, Schindler explained that the house would be built "as small and as cheaply as possible-$7000-for two families makes $350000 for each-an amount for which it would be impossible to build separately." The ordinary residential arrangement providing rooms for specialized purposes has been abandoned. Instead, each person receives a large private studio; each couple, a common entrance hall and bath. Open porches on the roof are used for sleeping. An enclosed patio for each couple, with an out-of-door fire place, serves the purposes of an ordinary living room. The form of the house divides the garden into several such private rooms. A separate guest apartment, with its own garden, is also provided for. One kitchen is planned for both couples. The house was constructed using Schindler's "Slab-Tilt" system-readily legible in the plans and elevations-in which reinforced concrete wall units, cast on the concrete slab floor, were hoisted into position using a tripod, block, and tackle. Schindler did not invent this system, and analogy with the work of Irving Gill is inevitable. Whether Gill was the catalyst is impossible to say, though he had used a similar system in his 1914 La Jolla Woman's Club, and he and Schindler had met by April 1921. Nonetheless, there are significant technical modifications and formal advances at Kings Road. Gill cast entire walls as units, which were lifted with machinery. Schindler divided the walls into units four feet on center, which could theoretically be lifted by two men. He expressed the nature of the construction by filling the voids between the slabs-created by the formwork-with glass, animating the walls and admitting light. Although Schindler projected on January 4, "we shall begin to build next week," surviving documentation is rife with mentions of delays caused by rain. In the interim, he "made a perspective sketch of the studio,-all black and gold" (fig. 11). Describing it to her mother, Pauline observed, "Its severity of line makes it a monumental thing." We've had the jolliest afternoon, digging trenches! Yes ........ The lot at King's [sic] Road seems to lie in the middle of all space. First we look up to the Hollywood Range, which lies from Pasadena to the sea; and then in the lower direction, we look over miles of quiet space..And now and then, as you dig your trench, and throw the spadefuls of good brown earth up, you here a meadow-lark singing. And you stop just at sunset, which is again a wide, lovely thing, and warms you with the thought of how the sunsets are to be watched from the windows of R.M.S's studio. Three days of coming home at 12 oclock-yesterday at 4 ocl. and now it is 2 in the morning-having spent both nights finishing concrete floors with Clyde-with stars and lights all around us-except our two rooms all floors are down now-and I sat carefully today smoothing your threshold towards the kitchen. I worked on the house all day-helping out as a "laborer" at the concrete mixer-all walls and floors are cast, exsepting the ones of our two studios-a sign is up announcing the "Slab-Tilt" construction. Optimism aside, the project continued to be plagued by rain: "the other day-after working on our floorfinish until 2 oclock in the morning, a sudden rain spoiled quite a portion of it." And the next day it was "raining again-and poor Chase [sic] is probably stomping around in the mud. He is very faithful to the job and has done very well in spite of the weather-I remember last year we lost only one week thru rain-this year it is already four. However it was not possible to wait-and another two weeks will see the walls being tilted up-which will end the concrete work." Nonetheless, already Schindler was "quite satisfied, the house will be a success-inspite of the many innovations involved." The garage and guest studio walls were up by April 4, and carpentry work began soon after (figs. 12, 13, 14). Structurally the house is a combination of the concrete wall slabs and a simple post-and-beam system. The roof construction consists of 3 × 8 inch redwood beams, two feet on center, exposed on the interior and covered with redwood shiplap (fig. 15, below left). It is supported on one side of each studio by a concrete wall, on the other by two wooden posts. Pairs of beams, 6 feet 2 inches above the floor and spanning each room, extend to the exterior to support cantilevered overhangs. The beams also support sliding pendant lights with paper shades; otherwise, they are nonstructural. Partitions and windows are nonsupporting redwood frames constructed of thin studs, extending from floor to ceiling, and rails-Schindler called them muntin bars-filled with glass or Universal Insulite, an insulation board made of pressed sugarcane, and held in place with "stops" (battens) (fig. 15, below right). Sliding screens in each studio opening to patios were canvas stretched in mahogany frames. The deceptive simplicity-borne out in recent restoration work-of Schindler's scheme became clear early in the building process. On April 14 he wrote, "Guestroom being covered ... but Clyde is slow-it will take five weeks yet I presume." He followed up a week later: "Clyde can not get carpenters-two came today-looked the job over-got scared-and ran-." They also ran afoul of the technology of the building system: on April 22 Schindler told Pauline, "now a few slabs won't 'tilt'-they stick-and we shall have to use wedges-otherwise the good news that another carpenter is making a try-garage, kitchen guestroom roofed over-plumber starting Monday." One significant change, a reconfiguration of the fireplaces in the S. P. G. and M. D. C. studios, was made to Schindler's plans during construction. As originally designed, the fireboxes were positioned side by side in the manner of those in the C. B. C. studio/Chace patio and the guest studio/Schindler patio (see figs. 7 and 8). The final back-to-back hexagonal design was indicated in the December 1921 drawings, but a subsequent note from Schindler to Pauline reveals that the sheet copper finally installed was a later decision. On March 20, he wrote, "Here is a question to be answered quickly-what color texture brick for your fireplace ... rough, smooth? yellow-tan-red-? Only colors of 'burned' clay are in place." Later, Schindler told Pauline that he was "trying to make a copper fireplace ... no brick." As the house neared completion, Schindler fully addressed the garden. He had made oblique references in his early sketches: the garden clearly was to be an architectural extension of the house, though scant details were provided. Along the way, Marian Chace tried her hand; in March she was "very busy already with the garden,-both vegetable and landscape," though Schindler commented a short time later, "Kimi's garden not very successful-the soil is hard to handle." The design had reached intellectual maturity by late April, when Pauline told her parents, "The latest blue-print ... includes the plan of the landscaping, sunken gardens and all." This blueprint is lost, but another drawing, probably completed later, fully conveys the genius of the place. The entire half-acre site was conceived as self-contained living space, laid out in a series of sliding and interlocking planes (fig. 16). Nowhere in the history of landscape had there been a garden like this. Bamboo hedges along the eastern and southern property lines provide privacy from the street and neighbors. The garden is divided internally with clipped hedges and changes in ground level-sunken gardens-that control circulation and create outdoor rooms for each of the three apartments, Schindler, Chace, and guest. As Pauline's sister Dorothy observed later, the place was "a little nation all its own." She had "not been out of it for two days-yet we live so that it's really like living outdoors, so you hardly miss not going away." A completion permit for the Kings Road house was issued on June 6, 1922, though work continued for several weeks after the couples moved in. The garden as well was a slow process. Schindler indicated at the time that it was premature to publish photographs of the house "since none of the planting is done-which is absolutely necessary to complete the scheme" (fig. 17). The guest studio was the first space in the house to be furnished; photographs taken in 1922 during Dorothy Gibling's occupancy give some indication of the aesthetics (figs. 18, 19). The finest early photographs of the house, taken in 1924 and lost to memory until recently, come from the archive of Swiss architect Werner Moser. The images provide extraordinary detail-the south (Schindler) sleeping porch, sometimes referred to by the Schindlers as a sleeping basket, has been enlarged to the west, the north basket is yet to be begun, and the original garage door is in place. Landscape work is under way-the stand of bamboo at the east end of the driveway and the Monterey cypress hedge are in place-but the garden overall is unkempt (figs. 20, 21, 22). About the same time, the house had a bit role-anonymous and upstaged-in a silent film. In four brief clips from Sherlock, Jr. (1924), Buster Keaton bicycles past, his comic gestures perhaps unwittingly providing an extraordinary glimpse of the house as it originally appeared in an open field with the Hollywood Hills in the background (fig. 23). The Kings Road house is an extreme example of architectural logic. Its bare-bones articulation is dictated by a spirit of reduction to an essence, not style per se. Schindler abandoned the traditional "onion-like ... layers of finishing materials,-lath, plaster, paint, paper, hangings, etc.," and wove together "a few structural materials which retain their natural color and texture throughout." Concrete walls and floors were untreated; redwood ceilings and window and door frames were wire-brushed to accentuate the grain and coated with a mixture of unboiled linseed oil and turpentine. Schindler described the house as "the beginning of a building system which a highly developed technical science will permit in the future. Each material will take its place openly in the structure, fulfilling all architectural and structural requirements of its place in the organic fabric of the building." Although much is eliminated, there is no sense whatsoever of artistic impoverishment. Using a consistent four-foot module and one basic structural unit, the tilt-up wall slab, Schindler created forms and spaces of extraordinary variety and richness. No two rooms are alike; he described each as representing "a variation on one structural and architectural theme." The house is particularly beautiful at night-a quality not lost on the Schindlers-with its soft lighting and seven fireplaces blazing. What is missing is creature comfort. The philosophy that only what is beautiful is comfortable has limits. Like many experimental works of architecture, the house demands to be lived up to. Dorothy Gibling wanted none of it. In a moment of pique, she described the guest apartment-the most complete space in the house-to her parents in 1922: "I s'pose it's R.M.S. 's queer ideas that have gone to make my room so lovely- so entirely in keeping-but to me they're most tremendously un understandable. When they interfere with comfort peace of mind." Dorothy was at once more charitable and less convincing in describing conditions in mid August: "It still continues about a hundred and sixty five during the daytime-but ... with six inch cement walls, the inside of this house stays reasonably cool." Coming from Vienna by way of Chicago, Schindler must have found the Southern California climate benign; still, there are extremes he did not take into account. The house can be insufferably hot-and very cold-and, as it was designed, there is no remediation. Numerous occupants have also left dismal reports of the leaking roof. The sleeping baskets, especially, seem optimistic. In 1924, Pauline described "a shattering wind that made sleeping for us upstairs seem like being up among the spanker-sails of a sailing-vessel." Attempts, especially by Pauline but also by Schindler himself, to correct physical shortcomings were unsuccessful. The house is finite; the rigor of the scheme precludes changes of any kind. The addition of the nursery to the Chace apartment-ostensibly under Schindler's supervision-seriously compromised the quality of light and space in the C. B. C. studio, the only one with two walls of concrete. The glazed bay, thematically consistent with the one in the R. M. S. studio, was blocked by the nursery walls; skylights were cut in as a makeshift. A nursery added to the west patio by Schindler in 1953 for his grandson, Eric, similarly intruded; it was removed in 1985. Pauline's changes over the years, including multiple layers of paint, wall paneling, floor coverings, enclosing the sleeping porches, and so on, made in the spirit of domesticity, suggest that the house was too radical even for her. Today we honor the Schindlers' intellect, creative spirit, and lives at Kings Road. As an architectural laboratory, the house is unsurpassed. It is the birthplace of the Southern California Modernism so celebrated today. Schindler worked there until his death, pursuing new ideas based on an evolving ideology and creating a body of work as vital today as it was incomprehensible to the East Coast establishment ninety years ago. Richard Neutra-who lived at Kings Road with his wife, Dione, between 1925 and 1930 and who went on to surpass Schindler in quantity, if not inventiveness-had his finest moment here with his design for the iconic town house for Philip Lovell, the first brilliant expression of the International Style in America. It's really too bad you couldn't have been here on Friday evening-for the recital-I never dreamed 835 could look so truly lovely and impressive. As folks rambled through the various rooms- across the courts with their open fires-I'm sure quite several of them were highly impressed. At any rate, I was. There seemed to be hundreds of people-but probably not more than fifty or sixty-and such a mixture-from the most formal to the long haired variety, though Helen Barr I were both rather disappointed to find how comparatively few really funny types there were! We knew no one so had planned to just watch the "passing show"-but were surprised rather by the high toned air of it all than the Bohemianism we had gleefully expected. Beginning in the early 1940s, activity at the house increasingly reflected Pauline Schindler's interest in radical social ferment. The Index, Un-American Activities in California, 1943-1961, reads like a roster of her friends and correspondents. John Howard Lawson (1894-1977), a blacklisted screenwriter, was the most prominent; shortly after his death he was identified as "the top Red in Hollywood." Others included Stephen H. Fritchman (1902-1981), under whose leadership the First Unitarian Church in Los Angeles became a center of liberal politics; Rose Chernin (1901-1995), executive secretary of the communist-backed American Committee for the Protection of the Foreign Born; and Berkeley Tobey (1881-1962), husband of Esther McCoy. Asked late in life about these associates, she responded, smiling, "They have all been here." Today, R. M. Schindler’s Kings Road House is celebrated as an icon of early modern architecture, but this wasn’t the case when it was finished in 1922. Though Schindler and his wife Pauline recognized its genius early on, its radical appearance was—and remains—incomprehensible to many. 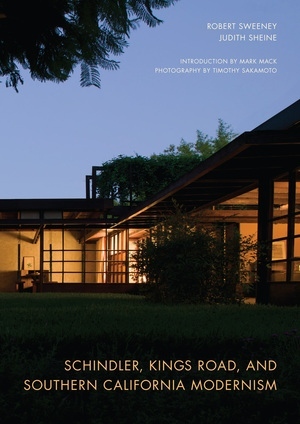 Lavishly illustrated with forty-five new photographs, this book is an incisive examination of the house, placing it in the context of the architect’s career and clarifying its influence on modern architecture and its practitioners. Little-known aspects of Schindler’s life, his relationship with his mentors, and the development of his unique theories about space enrich the narrative. Robert Sweeney focuses on the construction of the house and the people who lived, worked, and performed there, demonstrating the building’s significance in the social history of Southern California. He includes new research on Schindler’s educational and personal background in Vienna and a discussion of the critical influence of Pauline Schindler in formulating the social underpinnings of the house. Judith Sheine’s essay places the house in the context of Schindler’s career, in which it established the basis of the spatial development of his work. She also examines the influence of the house on the work of numerous architects from Frank Lloyd Wright to Frank Gehry. Robert Sweeney, an independent historian, is President, Friends of Schindler House. He is the author of Wright in Hollywood and Casa del Herrero. Judith Sheine, a practicing architect, is Professor and Chair, Department of Architecture, California State Polytechnic University, Pomona. She is the author of R. M. Schindler and R. M. Schindler: Works and Projects. "This book establishes R.M. Schindler’s Kings Road House amongst the icons of modernist housing—as crucial as Le Corbusier, Walter Gropius, Mies van der Rohe, or Frank Lloyd Wright to the story of twentieth-century residential design. Weaving together an impressive blend of primary sources, Sweeney and Sheine illuminate heretofore unknown or neglected stories regarding Schindler’s life, his relationship with his mentors—most notably, Wright himself—and the development of his unique theories about space. These essays will interest both scholars and practitioners of architecture as well as readers wishing to learn more about the development of architectural modernism in general.”—J. Philip Gruen, School of Design and Construction, Washington State University.